How about a nice and full, olive green lawn in your garden? We can make it happen with our Royal Grass Deluxe quality. 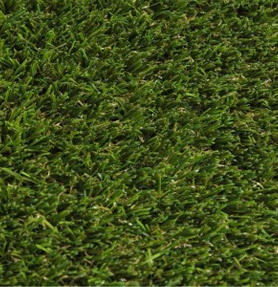 Made from three shades of green, this type of artificial grass is perfect, without having an unnatural look. In combination with resilient 36mm tall fibres, Royal Grass Deluxe will make your garden look like an oasis, rich and fresh green. This is a quality that has a neat density, which feels soft and above all, is safe for kids and pets, like all of our other types are. No less than three shades of green have been use to design Royal Grass Deluxe, the popular colours; lime green, summer green and olive green. The rootzone has a hint of green as well. The combining of these several tones have made this quality look like a type of green grass that’s mostly seen when the seasons change from spring into summer. Because it’s mixed greens, Deluxe fits in any situation. It’s a summery green synthetic grass, but it’s absolutely not too powerful! In depends on your personal taste which colour of artificial grass suits you best. But there’s more to take into account. For instance, what the position of your lawn is. In case you have a shady garden, it would be better to opt for a more light coloured synthetic grass to brighten up your garden. To optimally review the different colours we offer, it’s always good to see them in real life. For instance, you can visit a show garden near you or request samples. Please keep in mind that the grass may look very different on a small sample, compared to a large field. Royal Grass Deluxe has a 36 mm grass fibre. This higher fibre grass carpet looks full, but freshly mowed. True luxury in your garden! 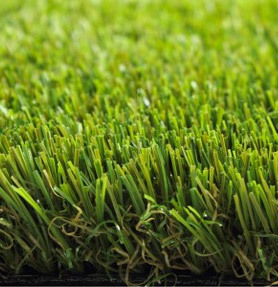 This artificial grass has the unique V-shaped fibre, which mimics nature for a stunning natural appearance. 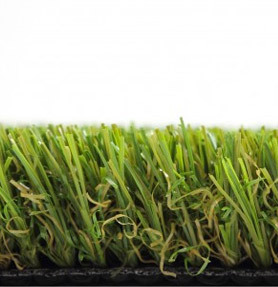 Thanks to the micro nerve technology (MiNT) the fibre has a mat, silky colour and has strongly reduced reflection, preventing the turf to have a ‘unrealistic and plastic look’. As a result, the fibre remains nice and upright and gives less reflection makes it looks very natural. Ten Cate – the world’s largest producer in the artificial grass industry – is Royal Grass’s technological partner. Deluxe is the result of intensive collaboration and both parties vouch for its durability and sturdiness. With Deluxe you choose for a fresh, summer green artificial lawn.